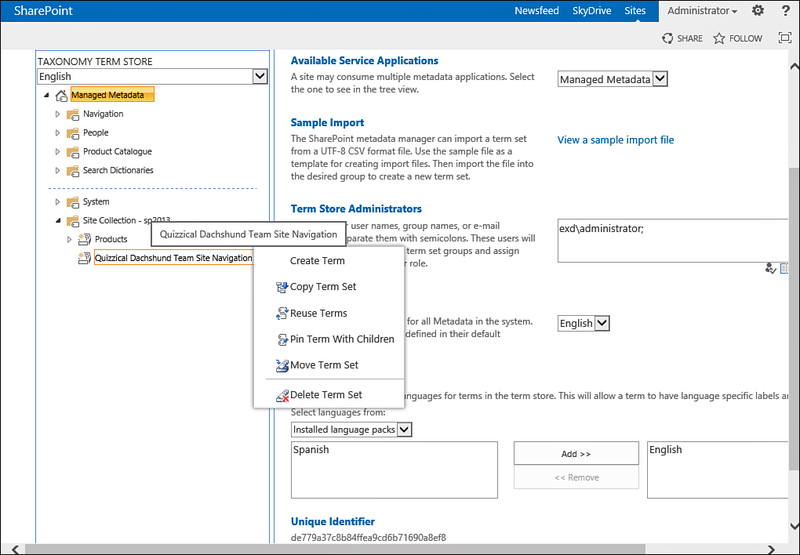 To add, remove, or edit terms in the term set, select the term set and click the Term Store Management Tool link (refer to Figure 1). This opens the site’s term store management tool that allows you to find the term set you want to edit. 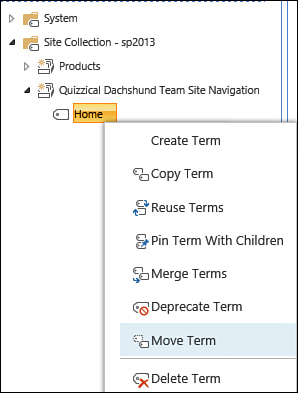 If you created a new term set, you should find it under the Site Collection group as shown in Figure 2; otherwise, find your term set from the list of term sets on the right. You can also get to the term store management page directly from the Site Settings page by clicking the Term Store Management link under the Site Administration section. After you find your term set, you can click it to open a drop-down menu that lets you create new terms in the term set, as shown in Figure 2. FIGURE 2. Creating a new term in an empty navigation term set. Clicking the Create Term option creates a new term, allowing you to type the name for that term. This is what will be displayed to the users in the navigation. Type the name, and press Enter, which will automatically create another term. If you don’t want another term, just click elsewhere. When you have created a terms, click on the term’s name. The page then shows on the right the settings for that term, including a Navigation tab with navigation settings for the term, as shown in Figure 3. Switch to that tab to specify whether the link should show in top navigation bars and/or left navigation bars, as well as the target link for the term. FIGURE 3. 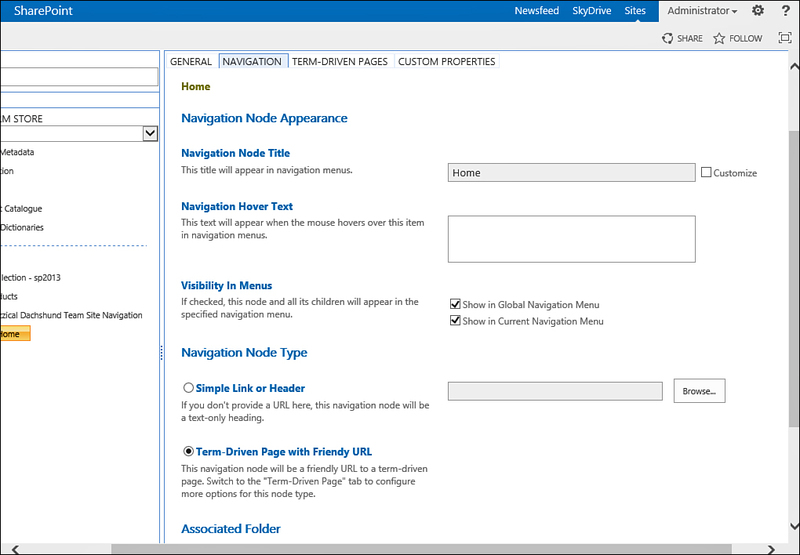 A term’s navigation settings page. To set a target, you first need to select the navigation node type, either a simple link or header, in which case you can specify a link to a page, or keep the link empty (making it a header without a link). Configuring a term-driven page with a friendly URL is covered in the next section. After setting the settings on the term, click Save at the bottom of the page before going on to edit other terms. To add terms under an existing term, move the term (to another term set or to be under a different term), or delete a term, hover the mouse cursor over the term’s name in the left bar, and open the drop-down menu for the term as shown in Figure 4. FIGURE 4. The drop-down menu for a term allows you to create terms under it, move the term, or delete the term.